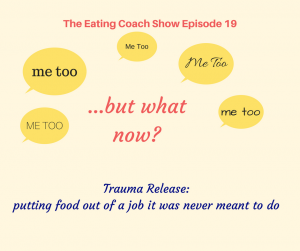 In today’s podcast, I discuss one method for releasing trauma, which put food out of the job of life manager for me – one that it was supremely unqualified to do. The whole ‘Me Too’ phenomenon where women publicly open up on social media about sexual assault or harrassment has sparked alot of debate. I steer clear of that in this episode and focus on the life-changing reframe of trauma that has helped me and others live our lives free of its power. No need for a time machine. There is no account in this episode of my experiences, so if you have found that others’ stories trigger you, there is no need to worry here. The main focus is on the process of resolving trauma. How an overwhelming event becomes trauma: The three stages of tribal initiation. Childhood trauma partially mimics tribal initiation, of which there are three stages. Trauma misses out on the third, vital stage, and this is why so many people feel unable to move on after overwhelming life events. What Goldie Hawn has to do with all of this. The liberating truth that will set you free from guilt: the real reason that so many people self-sabotage so badly in their lives. This is an unconscious attempt to resolve the trauma. Listen and find out exactiy how.